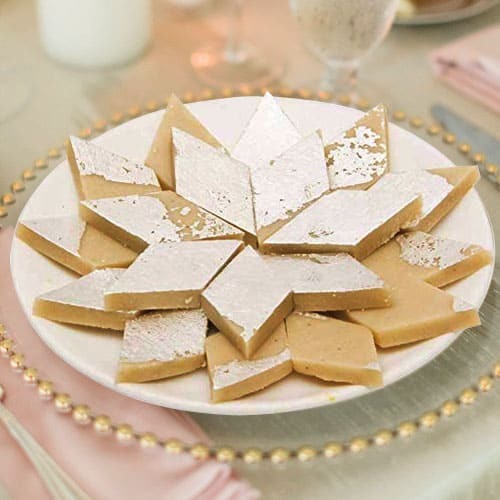 Send this best quality Delicious Badam Barfi from Haldiram to your loved ones and make a bash at their celebrations. This 1/2 Kg (Gross Weight) Badam Barfi from Haldiram will surely relish their taste buds. Flowers Delivery Mysore, Send sweets Shillong, Wedding Cake Cuttak, Diwali Mithai Mysore, Send Flowers and Gifts to Alwar, Online Shop Kakinada, Flower to Baramati, New Year Flowers Sirohi , Fresh Fruits Buldhana, Send Gift Udaipur, Dry Fruits to Yamunanagar, Birthday Delivery Rourkella, Sending to Alwar, Flower shop Srikalhasti, Taran Taran Online Cake Delivery.